By Ryan KostUnder a new rule that may be the toughest in the nation, at least 15 Oregon schools must get rid of their Native American-themed mascots by 2017 or risk losing state funding. The State Board of Education passed the new policy in a 5-1 vote Thursday afternoon. "I'm overwhelmed, but I'm holding back on my emotions--I have a meeting to finish," said board Chairwoman Brenda Frank, a member of the Klamath Tribes. "It's been a long time coming." The decision, in the works for six years, requires schools to eliminate names like "Indians," "Chiefs" and "Braves." "Warriors" may stay, but the logos may not reference tribal customs or traditions.Why the ban is needed:Nationally, there have been various pushes to do away with using race-based mascots for decades. The debate in Oregon schools picked up in earnest in 2006, when Che Butler, a former Taft High School student, brought the issue before the state board. Butler told The Oregonian at the time that he decided to go to the board after his school played the Molalla High Indians. During the game he saw a student dressed in buckskin and fake feathers performing stereotypical Native American dance moves. 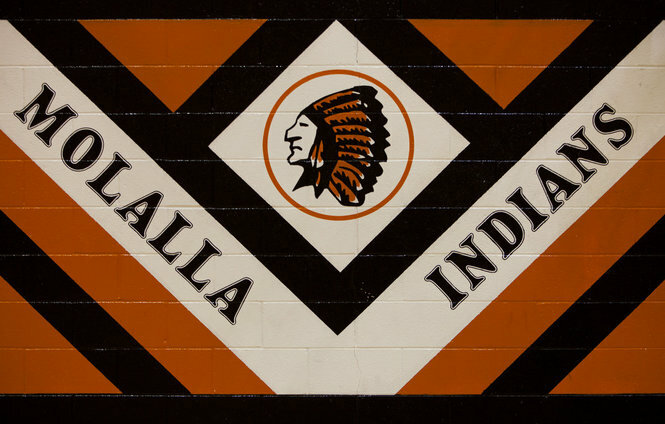 That sort of thing no longer happens at the games, according to Molalla administrators. Nevertheless, the school's Indian mascot is still present throughout the school. The logo, a profile of a Native American man with a lined face and headdress full of feathers, is displayed on lockers, painted on the gym's floor and rendered in metal in the courtyard. Arrows help guide visitors through the hallways and drawings of spears decorate the walls. A totem pole and teepee are displayed on the school's soccer field. During a visit earlier this week, two boys walked through the cafeteria, drumming on an empty water jug and chanting. The school is--very proudly--"Home of the Indians!!! "Comment: The Plains chief, teepee, and totem pole have nothing to do with Oregon's Indians. They're just plain wrong. A school setting that's supposed to educate youngsters is the worst place for such misinformation. The arrows, spears, drums, and chants are "merely" stereotypical. They falsely imply that Indians are primitive people of the past. As always, it's racist to single out Indians for this belittling treatment. For more on Indian mascots, see Indian Place Names = Mascots and The Most Racist Pro Sports Logo.